How to Build a Sustainable, Scalable, and Profitable Business. It is a big shift going from employee working for someone else and in a company to working for yourself, but no one tells you how to be an entrepreneur successfully. You have probably heard the expression about how the business runs you more than you running it for business owners, but what if you took the reigns and lead your business so it runs even if you are not around? Whether you are a solo entrepreneur, small business, or growing enterprise, you will want to set your business up for success and make it sustainable, scalable, and profitable. First off, the word sustainable here refers to financial sustainability and as an entrepreneur you are going to want to set up your business model, offers, and planning to create sustainable long term income. If you are a service professional solely building your business based on private clients, this most likely will not create sustainable, consistent income because clients come and go and there are fluctuating busy seasons in the year. There are a few business models and offers that support great sustainability. By simply developing a group offer or including diversity in your offers like products, all of a sudden your business is positioned for sustainability. Sustainability can also be created with services and products that people need frequently or use daily. Scaling Your Business to Leverage Your Time, Income, & Energy! A lot of small business owners or solo entrepreneurs think scaling is only for the big guys, but you better give your head a shake and listen up here because it is the solo entrepreneur stuck doing everything on their own that needs to have a scaling business plan in place. Scaling your business means setting it up for growth where what you offer can be duplicated to greater numbers of people. Get excited to scale because it not only brings you more money, but also usually more time freedom too! Scaling sometimes means duplicating yourself in your business where you have other practitioners doing what you are where you are now paid for your own hour, but also receive income from them as well. You can also scale your business by packaging your knowledge and skill into a product that can be sold to more people like an online course or product. In addition, whenever you introduce an offer where you make more money in less time, this also scales you for growth. Workshops where you can teach multiple people at once instead of private sessions, is a method of scaling your business. For all you small business owners out there, profit is not a word only reserved for the big corporations, so get close and personal with the word profit and how about planning for profit in your business?! Profit is not net because the net is sales minus your expenses, but then you need to pay you as well. Profit is that dollar number above and beyond your salary. Imagine paying yourself well and still having money in the bank! Now that is a great thought and one you should plan and expect from your business of course over time. 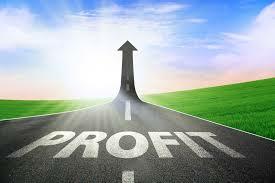 So how do you plan for profit in your business? When you know your numbers which include your full expenses and what your sales are, you are able to play with the numbers to produce different outcomes. Often profit comes directly from more sales, but what if it came from less sales and a bigger price point offer? That is entirely possible too. Sales can be increased by more offers as well and the exciting part of that is those offers do not have to be all your own; they could come from being an affiliate. Being an entrepreneur is not about you having to do everything yourself nor is it about accepting that the business will run you and your life. This is a whole topic unto itself that we will explore more, but in the meantime what you have learned here about building a business that is sustainable, scalable, and profitable, is it’s not about you doing everything yourself. It is also about choosing a business model, offers, and planning that will leverage your time, energy, and income! This takes business strategy and business coaching to schedule, plan, and implement what works best for you and the life you want to have with your business. Moral of the story, build your business to be sustainable, scalable, and profitable! If you plan it right, you will be running your business not the other way around and yes you can have time, energy, and financial freedom in your own business. Lastly for all you small business owners and solo entrepreneurs, you need to set yourself up to scale and most definitely plan to profit! If you are excited by the time and financial freedom concept in your business or the sustainable and scalable plans for profit, reach out for business coaching to build a business you are running! Reach out here or contact me directly at jody@jodykennett.ca. Here’s to being small and profitable and scaled for growth that brings more time and energy back into your life.